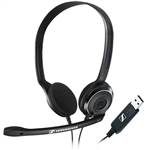 Here you will find the full range of Sennheiser DW Headsets. From the entry level DW Office through to the DW Pro Range, both great for Voice Recognition. Unlike the DW Office Range, the DW Pro Range has a flexible Microphone which can be adjusted for optimum sound level. This is ideal for use with Speech Recognition and offers even better accuracy with Dragon Naturally Speaking! The Pro Range also boasts Ultra Noise Cancelation which gives even more voice clarity. Another great feature when using Speech Recognition software in a busy environment such as the office.